Experience strange days in this cyberpunk horror game. What is it? A sci-fi horror game that is basically David Lynch's Blade Runner in first-person. Observer is set in Poland in the year 2084, which isn't an exact century after 1984 by coincidence. Poland in 2084 is an Orwellian dystopia, especially the city of Krakow which at least in this game seems more fun to say than to visit. Krakow. Rubbish squats in corners. Propaganda posters and ads for products made by the all-powerful Chiron corporation are everywhere and interchangeable (they're also in Polish, though English appears when you mouse over). When you step outside a curfew announcement plays as a flying car disturbs a flock of pigeons and animated billboards flicker. It's cyberpunk as all get-out. Specifically it's Blade Runner, even down to having Rutger Hauer voice the protagonist. He's Dan Lazarski, a neural cop or 'Observer' able to hack into people's brainchips and relive their memories in a way that's super invasive and also kind of inefficient. When you dive into someone's skull you experience their subconscious as a jumble of cut-up memories and visual metaphors for their emotional state. It's part Snatcher, part Psychonauts, part spooky hallway walking. But its surrealness is only effective to a point, one I reached quickly. In the mind of a dying murder victim I relive entering his apartment like I did in reality moments before. The instant I step in something smashes through the window—then time rewinds and that object flies back through suddenly repaired glass. Past the entrance I loop, finding myself outside the apartment, and re-enter. The layout's different this time, with nonsensical touches like a tap pouring water onto a chair and a door opening onto a blank cement wall covered in tally marks, like a jail cell. That's how I learn this man spent time in prison, and still feels trapped in his daily life. Observer is made by the same team as horror game Layers of Fear, and if its spooky hallways worked on you so will these. When your movement speed is increased to a run so that you feel pursued through looping rooms, when you walk across a platform over an abyss and swarming birds squawk upwards around you, in those moments the surrealness of Observer is effective. Outside people's heads it's a combat-free adventure game minus inventory puzzles. You scan crime scenes for clues with cybernetic eyes, interrogate apartment dwellers through vidscreen doors, and solve basic puzzles. It's very atmospheric, focused on one small location, a run-down tenement and a couple of nearby buildings which Dan comes to looking for his estranged son before stumbling across multiple murders. Spotlighting this small area for its six-to-eleven hours means Observer evokes a strong sense of place. There are exposed pipes everywhere, cascades of broken AR data curtaining off walls, a janitor with busted prosthetics, all details that work to make the setting feel mundane and broken. It's a deliberate contrast to the fanciful dreamscapes. When the two bleed together, like when Dan's own memories intrude on the minds of others, or reality (filtered through his cyber eyes and brain implants) starts to glitch in ways familiar from those dreams it's genuinely shocking. Eventually it stops being able to disguise how much you're just holding down W to walk past weird stuff. That's Observer at its best, a grimy cyberpunk detective story that veers into extended flights of fancy, Blade Runner if the unicorn bits made up half the runtime. But Observer isn't always at its best. Those flights of fancy drag on and don't always have much to say. Straight after the prison wall moment there's a laundry room where piles of computer equipment and clothes glitch into different positions. It's not telling you anything interesting about the character, it's just a visual effect that looks kind of cool. After seeing a bunch of those in a row I stopped being able to process the novelty. It doesn't help that they're structured so much like every first-person horror game about walking down halls towards spooky doors. In Observer you open doors by clicking on them then pushing or pulling just like in Amnesia, a cute technique for emphasising the dread of finding out what's on the other side, but so much of Observer is opening doors to look into another weird room that it's numbing. Eventually it stops being able to disguise how much you're just holding down W to walk past weird stuff. Livening up the dreams are cat-and-mouse sequences in which you have to sneak past something that kills you if you're seen, pushing you back to the last checkpoint. The first couple of these work fine, but like so much of Observer they're overused, and autofail stealth shoehorned into non-stealth games isn't something I had much patience for to begin with. The entire climax of Observer is one of these, and it detracts so much from the story's final twists. 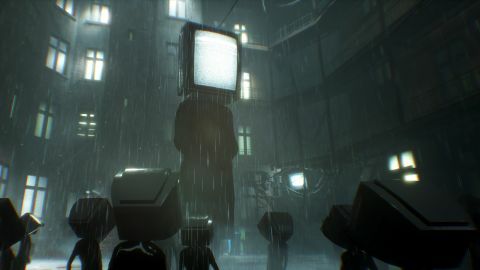 Observer has a few other flaws as well—it uses 'jump scares', obscures its visuals with chromatic aberration, sometimes judders even on high-end graphics cards, only allows for one savegame—and while those might be dealbreakers for some they didn't particularly bug me. What really undid Observer for me, beyond pulling the same tricks out of its bag over and over, is that it boils down to a familiar family story. We never get to see Dan's job when he's out there being a corporate-sponsored cybercop who hacks brains, because minutes into Observer he gets a call from a son he hasn't seen in years and races off to find him. It engages with potentially rich themes about surveillance and privacy only superficially, because Dan's motivation is a relatable one. He's not a tool of the state today, he's a concerned father. He's not Deckard in Blade Runner, he's Liam Neeson in Taken, and that's less interesting. Observer makes me feel like a parent myself, in that I'm not mad at it—just disappointed.